With the two-week countdown at our doorstep everyone has an extra dose of jolly in their step. Diaries are filled with parties, house have been trimmed with all things festive, holiday playlists are cued for every occasion and presents are being carefully selected, and charmingly wrapped, then placed under the tree. It’s all systems go. One thing that’s always priority on the Christmas activity list is snuggling up with favorites in front of one of the many Christmas films, there’s nothing sweeter. Picture this; lights dim, evergreen candles lit, twinkling lights on the garland flickering in subtle pattern, the crackling of a fire creating a soothing background noise with your favorite Christmas classic as the entertainment. There’s an endless selection so in hopes of inspiring your Christmas film marathon we’ve narrowed down some of our favorites to add to your watch list this year. 1. The romantic. If there’s one film that always ranks at the top of my list during this time of year, it’s this one. Surely I’m not alone when admitting that I can sadly recite nearly every line in this script. This season is already bursting with love, but add in a wintry cozy cottage and a dose of English accents, and you’ve got yourself the perfect ingredients for a chick flick. All that’s left to do is invite the girls around for some mulled wine + minced pies. 2. The classic. Looking for a feel good film to bring you back to yesteryear when times were a little slower? This classic checks all of those boxes and leaves us with the quote that lives on for decades. It’s a story that we can all relate to, going through turmoil + struggle that ends up triggering a realization of true happiness and the important things in life. This sweet family flick is one that’s found in any good Christmas collection and one that has us ringing our bells while trimming the tree. 3. The family film. Not only is the soundtrack packed full of Christmas favorites but the story takes place in only the most Christmassy city in all of America, NYC. This movie has us plotting with Kevin to stay safe + urging him to enjoy the city on his Dad’s card. It leaves us questioning ourselves on what we would’ve done in New York if our family was away. Plaza Hotel room service anyone? 4. The traditional. This film was always a tradition in our household and perfectly captured the magic of Christmas. In fact, upon seeing so many ‘Santa’s’ in a variety of malls + shopping centers, my mom would assure me that the real Santa was either in the North Pole or at the Macy’s in NYC, and that all of the others were just his helpers. Needless to say the first time I stepped foot into this special department store on the corner of 34th street my little heart was overjoyed. This timeless film is one that is sure to get you in the Christmas spirit + having you believing in Santa time and time again. 5. Laugh out loud. The last name of this family has taken on a definition of its own, it’s used to describe the neighbor’s over-the-top decorations or that tacky Christmas outfit. This movie plays on so many real life Christmas scenarios and has us in hysterics by the end. Hysterics + completely worn out by everything that has happened. If only we could give his boss a piece of our mind, I mean jelly-of-the-month club!? 6. The modern favorite. When I think of this film all of the memorable quotes come to mind and I immediately picture Will Ferrell shouting ‘Santa’ so enthusiastically at the top of his lungs. Watching this oversized, completely out-of-place + sensitive elf navigate through NYC is hilarious. There are a plethora of other holiday favorites we could have chosen but these were just a few that remain a necessity on our ‘must watch list’. 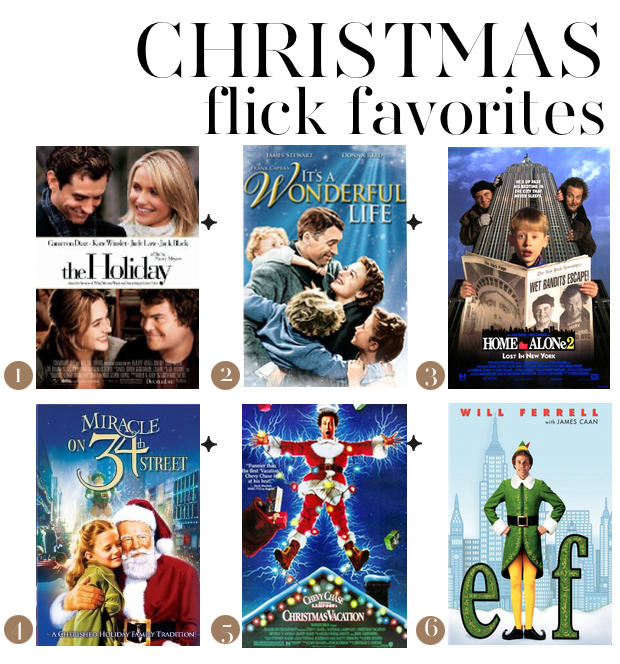 It’s time to grab a blanket, a cup of hot cocoa and start your Christmas movie marathon. I just watched The Holiday! It was so awesome! I loved it! My fave is It’s a Wonderful Life. You want the moon?